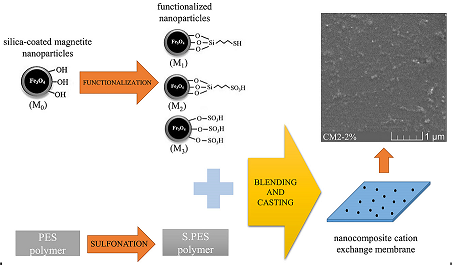 Nanocomposite cation exchange membranes (CEMs) were prepared by adding various amounts of functionalized silica-coated magnetite nanoparticles to the sulfonated polyethersulfone (sPES) polymeric matrix. The particles were synthesized first by the co-precipitation method (M0). Different surface modifications were then carried out on them by grafting three functional groups of mercaptopropyl, propylsulfonic acid, and sulfonic acid to yield functionalized particles of M1, (M2, ion exchange capacity (IEC)= 3.09 meq.g-1), and (M3, IEC= 2.88 meq.g-1), respectively. The SEM images of nanocomposite membranes verified a uniform dispersion of the nanoparticles in the membrane matrix. The nanoparticles provided more ion exchange groups and regulated water content of the membrane, and consequently enhanced its transport properties, IEC, and conductivity. The maximum values of IEC and conductivity of nanocomposite membranes were 1.8 meq.g-1 and 0.274 S.cm-1 corresponded to the membranes having 3 and 2 wt% of M2 nanoparticles, respectively. The maximum ion conductivity of nanocomposite membrane was about 2 times higher than that of sPES membrane. The nanocomposite membranes containing functionalized silica-coated magnetic nanoparticles showed superior IEC, water uptake, membrane conductivity, and transport number compared to those values for the membranes containing corresponded functionalized silica nanoparticles. N. Yamada, T. Yaguchi, H. Otsuka, M. Sudoh, Development of trickle-bed electrolyzer for on-site electrochemical production of hydrogen peroxide, J. Electrochem. Soc. 146 (1999) 2587-2591. T. Wen, G.S. Solt, Y.F. Sun, Modelling the cross flow spirally wound electrodualysis (SpED) process, Desalination, 103 (1995) 165-176. Y. Journal of Electroanalytical ChemistryKobuchi, H. Motomura, Y. Noma, F. Hanada, Application of ion exchange membranes to the recovery of acids by diffusion dialysis, J. Membr. Sci. 27 (1986) 173-179. R.K. Nagarale, G.S. Gohil, V.K. Shahi, Recent developments on ion-exchange membranes and electro-membrane processes, Adv. Colloid Interface Sci. 119 (2006) 97-130. F. Fu, Q. Wang, Removal of heavy metal ions from wastewaters: A review, J. Environ. Manage. 92 (2011) 407-418. M.A. Hickner, H. Ghassemi, Y.S. Kim, B.R. Einsla, J.E. McGrath, Alternative polymer systems for proton exchange membranes (PEMs), Chem. Rev. 104 (2004) 4587-4612. D. Chen, M.A. Hickner, E. Agar, E.C. Kumbur, Optimized anion exchange membranes for vanadium redox flow batteries, ACS Appl. Mater. Interfaces, 5 (2013) 7559-7566. 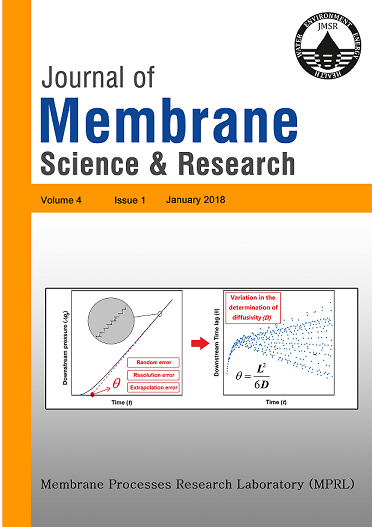 T. Xu, Ion exchange membranes: State of their development and perspective, J. Membr. Sci. 263 (2005) 1-29. A.F. Ismail, W.J. Lau, Theoretical studies on structural and electrical properties of PES/SPEEK blend nanofiltration membrane, AlChE J. 55 (2009) 2081-2093. C. Klaysom, S.-H. Moon, B.P. Ladewig, G.Q.M. Lu, L. Wang, Preparation of porous ion-exchange membranes (IEMs) and their characterizations, J. Membr. Sci. 371 (2011) 37-44. R. Guan, H. Zou, D. Lu, C. Gong, Y. Liu, Polyethersulfone sulfonated by chlorosulfonic acid and its membrane characteristics, Eur. Polym. J. 41 (2005) 1554-1560. M.-S. Kang, Y.-J. Choi, I.-J. Choi, T.-H. Yoon, S.-H. Moon, Electrochemical characterization of sulfonated poly(arylene ether sulfone) (S-PES) cation-exchange membranes, J. Membr. Sci. 216 (2003) 39-53. H. Dai, R. Guan, C. Li, J. Liu, Development and characterization of sulfonated poly(ether sulfone) for proton exchange membrane materials, Solid State Ionics, 178 (2007) 339-345. K. Matsumoto, T. Nakagawa, T. Higashihara, M. Ueda, Sulfonated poly(ether sulfone)s with binaphthyl units as proton exchange membranes for fuel cell application, J. Polym. Sci., Part A: Polym. Chem. 47 (2009) 5827-5834. C. Klaysom, R. Marschall, L. Wang, B.P. Ladewig, G.Q.M. Lu, Synthesis of composite ion-exchange membranes and their electrochemical properties for desalination applications, J. Mater. Chem. 20 (2010) 4669-4674. Y. Shen, X. Qiu, J. Shen, J. Xi, W. Zhu, PVDF-g-PSSA and Al2O3 composite proton exchange membranes, J. Power Sources, 161 (2006) 54-60. P.T. Nonjola, M.K. Mathe, R.M. Modibedi, Chemical modification of polysulfone: Composite anionic exchange membrane with TiO2 nano-particles, Int. J. Hydrogen Energy, 38 (2013) 5115-5121. S.M. Hosseini, P. Koranian, A. Gholami, S.S. Madaeni, A.R. Moghadassi, P. Sakinejad, A.R. Khodabakhshi, Fabrication of mixed matrix heterogeneous ion exchange membrane by multiwalled carbon nanotubes: Electrochemical characterization and transport properties of mono and bivalent cations, Desalination, 329 (2013) 62-67. N. Hasanabadi, S.R. Ghaffarian, M.M. Hasani-Sadrabadi, Magnetic field aligned nanocomposite proton exchange membranes based on sulfonated poly (ether sulfone) and Fe2O3 nanoparticles for direct methanol fuel cell application, Int. J. Hydrogen Energy, 36 (2011) 15323-15332. S.M. Hosseini, M. Askari, P. Koranian, S.S. Madaeni, A.R. Moghadassi, Fabrication and electrochemical characterization of PVC based electrodialysis heterogeneous ion exchange membranes filled with Fe3O4 nanoparticles, J. Ind. Eng. Chem. 20 (2014) 2510-2520. A.S. Teja, P.-Y. Koh, Synthesis, properties, and applications of magnetic iron oxide nanoparticles, Prog. Cryst. Growth Charact. Mater. 55 (2009) 22-45. S. Laurent, D. Forge, M. Port, A. Roch, C. Robic, L. Vander Elst, R.N. Muller, Magnetic iron oxide nanoparticles: synthesis, stabilization, vectorization, physicochemical characterizations, and biological applications, Chem. Rev. 108 (2008) 2064-2110. R.D. Zysler, D. Fiorani, A.M. Testa, Investigation of magnetic properties of interacting Fe2O3 nanoparticles, J. Magn. Magn. Mater. 224 (2001) 5-11. B.A. Zasónska, N. Boiko, O. Klyuchivska, M. Trchová, E. Petrovský, R. Stoika, D. Horák, Silica-Coated &#947;-Fe2O3 Nanoparticles: Preparation and Engulfment by Mammalian Macrophages, J. Nanopharmaceutics Drug Delivery, 1 (2013) 182-192. S. Čampelj, D. Makovec, M. Drofenik, Functionalization of magnetic nanoparticles with 3-aminopropyl silane, J. Magn. Magn. Mater. 321 (2009) 1346-1350. C. Huang, B. Hu, Silica-coated magnetic nanoparticles modified with γ-mercaptopropyltrimethoxysilane for fast and selective solid phase extraction of trace amounts of Cd, Cu, Hg, and Pb in environmental and biological samples prior to their determination by inductively coupled plasma mass spectrometry, Spectrochim. Acta, Part B, 63 (2008) 437-444. A.-H. Lu, E.L. Salabas, F. Schüth, Magnetic nanoparticles: synthesis, protection, functionalization, and application, Angew. Chem. Int. Ed. 46 (2007) 1222-1244. G. Kickelbick, Concepts for the incorporation of inorganic building blocks into organic polymers on a nanoscale, Prog. Polym. Sci. 28 (2003) 83-114. Y. Oren, V. Freger, C. Linder, Highly conductive ordered heterogeneous ion-exchange membranes, J. Membr. Sci. 239 (2004) 17-26. D. Liu, M.Z. Yates, Tailoring the structure of S-PEEK/PDMS proton conductive membranes through applied electric fields, J. Membr. Sci. 322 (2008) 256-264. M. Eikerling, A.A. Kornyshev, A.M. Kuznetsov, J. Ulstrup, S. Walbran, Mechanisms of proton conductance in polymer electrolyte membranes, J. Phys. Chem. B, 105 (2001) 3646-3662. S.B. Brijmohan, M.T. Shaw, Magnetic ion-exchange nanoparticles and their application in proton exchange membranes, J. Membr. Sci. 303 (2007) 64-71. P. Daraei, S.S. Madaeni, N. Ghaemi, M.A. Khadivi, B. Astinchap, R. Moradian, Fouling resistant mixed matrix polyethersulfone membranes blended with magnetic nanoparticles: Study of magnetic field induced casting, Sep. Purif. Technol. 109 (2013) 111-121. K.S. Roelofs, T. Hirth, T. Schiestel, Sulfonated poly(ether ether ketone)-based silica nanocomposite membranes for direct ethanol fuel cells, J. Membr. Sci. 346 (2010) 215-226. M.M. Hasani-Sadrabadi, E. Dashtimoghadam, S.R. Ghaffarian, M.H. Hasani Sadrabadi, M. Heidari, H. Moaddel, Novel high-performance nanocomposite proton exchange membranes based on poly (ether sulfone), Renewable Energy, 35 (2010) 226-231. H. Zarrin, D. Higgins, Y. Jun, Z. Chen, M. Fowler, Functionalized graphene oxide nanocomposite membrane for low humidity and high temperature proton exchange membrane fuel cells, J. Phys. Chem. C, 115 (2011) 20774-20781. X. Zuo, S. Yu, X. Xu, R. Bao, J. Xu, W. Qu, Preparation of organic–inorganic hybrid cation-exchange membranes via blending method and their electrochemical characterization, J. Membr. Sci. 328 (2009) 23-30. K.T. Park, S.G. Kim, J.H. Chun, D.H. Jo, B.-H. Chun, W.I. Jang, G.B. Kang, S.H. Kim, K.B. Lee, Composite membranes based on a sulfonated poly(arylene ether sulfone) and proton-conducting hybrid silica particles for high temperature PEMFCs, Int. J. Hydrogen Energy, 36 (2011) 10891-10900. A.-L. Morel, S.I. Nikitenko, K. Gionnet, A. Wattiaux, J. Lai-Kee-Him, C. Labrugere, B. Chevalier, G. Deleris, C. Petibois, A. Brisson, M. Simonoff, Sonochemical Approach to the Synthesis of Fe3O4@SiO2 core−shell nanoparticles with tunable properties, ACS Nano, 2 (2008) 847-856. P.I. Girginova, A.L. Daniel-da-Silva, C.B. Lopes, P. Figueira, M. Otero, V.S. Amaral, E. Pereira, T. Trindade, Silica coated magnetite particles for magnetic removal of Hg2+ from water, J. Colloid Interface Sci. 345 (2010) 234-240. W. M. Van Rhijn, D. E. De Vos, B. F. Sels, W. D. Bossaert, Sulfonic acid functionalised ordered mesoporous materials as catalysts for condensation and esterification reactions, Chem. Commun. (1998) 317-318. C.S. Gill, B.A. Price, C.W. Jones, Sulfonic acid-functionalized silica-coated magnetic nanoparticle catalysts, J. Catal. 251 (2007) 145-152. M.A. Zolfigol, A. Khazaei, M. Mokhlesi, F. Derakhshan-Panah, Synthesis, characterization and catalytic properties of monodispersed nano-sphere silica sulfuric acid, J. Mol. Catal. A: Chem. 370 (2013) 111-116. N.P. Gnusin, N.P. Berezina, N.A. Kononenko, O.A. Dyomina, Transport structural parameters to characterize ion exchange membranes, J. Membr. Sci. 243 (2004) 301-310. F.A. Siddiqi, I.R. Khan, S.K. Saksena, M.A. Ahsan, Studies with model membranes, J. Membr. Sci. 2 (1977) 245-261. N.P. Berezina, N.A. Kononenko, O.A. Dyomina, N.P. Gnusin, Characterization of ion-exchange membrane materials: properties vs structure, Adv. Colloid Interface Sci. 139 (2008) 3-28.